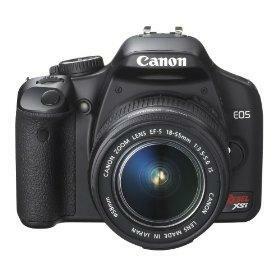 Canon's Digital Rebel is great for product photography. If you're considering selling items on eBay or other Internet shopping sites, then you might be searching for the best camera for product photography. The goal of product photography is to make an item look as attractive as possible, so it entices buyers. Successful product photographers are able to capture fine details of an object clearly without compromising the overall integrity of the item. The sharper an object looks on a website, the more interest it will generate. This is why it is important to shoot with a camera that captures high-resolution digital images for the Web and print. Most veteran product photographers shoot with digital cameras for two reasons: cost and convenience. The cost of purchasing and processing film adds up quickly. In regards to convenience, photos taken with a film camera will have to put into a digital format and burned on a CD before you can display them on the Web. What's more, with traditional film cameras there's no way to tell if you have captured a clean shot until you process the prints. It's much faster and easier to shoot with a digital camera equipped with a LCD display screen. The LCD allows you to view what the camera's lens sees. This helps you determine whether your subject is centered and in focus, as well as if the lighting is appealing. Fill Flash: This setting is offered on select digital cameras. It allows you to capture crystal-clear shots even if your item is backlit or there are harsh shadows present. The fill flash provides light where it is needed most. Flash Off: This is a common feature found on most moderately priced digital cameras. Bad lighting will make your item look washed out or the edges will appear too sharp and the shadows too hard. To eliminate these problems and reduce reflection spots, look for a camera that provides the option of turning off the built-in flash. Automatic Intensity Adjustment: This feature works in conjunction with your camera's close-up mode. Most cameras' flash units are intended to light subjects situated three feet away or farther, not ones that are sitting 10 inches away. To avoid washing out an object, activate the Automatic Intensity Adjustment feature, which helps modify the flash according to individual situations. If you are planning to shoot smaller items, such as coins, stamps or jewelry, then you want to purchase a camera that offers a macro-focus setting. This feature allows the camera to focus on a subject closer than is in its normal focus range, which for many point-and-shoot digital cameras is about three feet. A decent macro-focus will focus within an inch of the object without distorting its appearance. Remote Control Timer: This feature allows you to set up the camera on a tripod and move away so your shadow does not appear in the photo. It is also helpful in that it eliminates any jarring to the camera that may come when you hit the shutter button. AC Adapter: Digital cameras require a lot of power. You can save on batteries by choosing a camera that comes with an AC adapter. Kodak EasyShare. Kodak's line of EasyShare digital cameras provide exceptional picture quality for not a lot of money. This collection of digital cameras is best suited for amateur photographers who casually sell items on the Internet. The cameras come with a wealth of hardware and software to help you get stunning images on the Web. Canon EOS Digital Rebel Xsi. This moderately-price 12.2-megapixel digital SLR camera provides superior image quality and sports a large three-inch LCD screen. Fuji FinePix S5 Pro. This top-of-the-line digital camera is a popular choice for the pros. It is specially designed for studio and product photography and has a dynamic range of features. In addition, its commercial photography applications are second to none and offer film-like results. It has all the bells and whistles, but also comes with a steep price tag. When choosing the best camera for product photography, remember, the most important factor is comfort. If a camera feels good in your hands and takes decent pictures, then you will be more apt to use it.